Fred Klonsky, a retired public school teacher from Chicago is reporting on his blog that Persepolis, the best-selling graphic novel by Marjane Satrapi is currently being removed from Chicago Public Schools. "Good morning, Yesterday afternoon, one of the Network Instructional Support Leaders stopped be my office and informed me (per a directive during the Chief of Schools meeting on March 11) that all ISLs were directed to physically go to each school in the Network by Friday (3/15) to: *Confirm Persepolis is not in the library, *Confirm that it has not been checked out by a student of teacher, *Confirm with the school principal that it is not being used in any classrooms, *And to collect the autobiographical graphic novel by Marjane Satrapi from all classrooms and the Library. I was not provided a reason for the collection of Persepolis. If I learn more I will inform all staff. 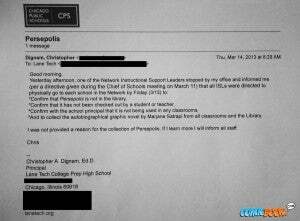 "I have been told that some students reported the removal of Persepolis in a journalism course," Klonsky reports. "As reporters, those students called CPS central offices to try to find out what had happened and why the books were being removed." Sources within the the Chicago activist community claim there is a student-planned sit-in protest organized for tomorrow. It's possible that this is all a misunderstanding, rather than censorship, as Klonsky quotes a Chicago Teacher saying, "News on social media boards yield that CPS is claiming that there was a set of new books sent to schools and the distributor included copies of this one by mistake. Since CPS hadn’t paid for them, schools were asked to pull the books and send them back. 'a mix-up.' The books, in fact, were purchased some years ago by an English teacher when she applied (and received) a grant to pay for them." Of course, all of that could be true. If Chicago Public Schools didn't realize that a particular educator at one of their schools had purchased copies directly and specially, they could be attempting to fix a district-wide problem and simply painting with too broad a brush. 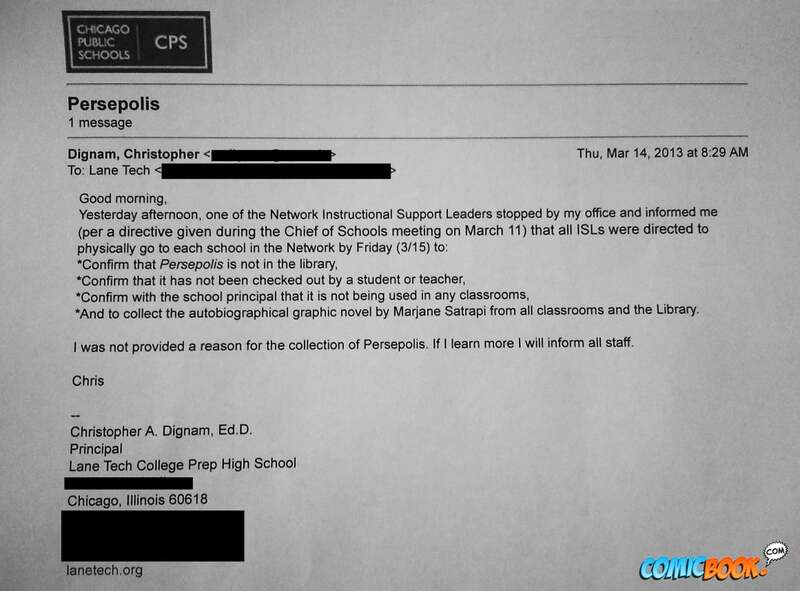 "Per the CPS Office of Literacy and our Chief Lynda Williams, there is a RECALL for the book Persopolis. Please remove these books from your schools’ classrooms and libraries. Your school’s ISL will pick these books up next week. "Should you have any questions, please call or email me." The book tells of growing up in revolutionary Iran, and is one of the most critically-acclaimed graphic novels of the last twenty years. An animated feature film adaptation was released in 2007, winning a Jury Prize at the Cannes Film Festival and drawing a Best Animated Feature Film nomination at the Academy Awards. The film was banned in Lebanon for being "offensive to Iran and Islam." A group of parents in Bothell, Washington, tried to have both the film and graphic novel removed from curriculum in 2009, but the school board rejected their demands, saying "other educational goals – such as that children should not be sheltered from what the board and staff called 'disturbing' themes and content – outweighed the crudeness and parental perogative." Pantheon, Persepolis's publisher, has been contacted but (likely due to the late hour) has not yet provided a reply.